Okay - so my pattern alteration hasn't been posted yet, the good news is that I'm happy with the adjustments but I'm still working up a few example to photograph before posting about it properly... it seems that it is going to have to wait until after Christmas now. I have been busy with a few other projects though, both of which got started during my recent hospital stay. Both of these are Christmas presents but the recepent's don't read this blog so you can all have a preview. First off we have a blue totoro from the fantastic studio ghibli film "My neighbour Totoro*. The pattern for this guy is freely avaliable from Heavens_hellcat's LiveJournal here. I love this little guy and I'm sorely tempted to make another one up for me as well as one of the little white totoro's to keep him company. My other handmade Christmas gift (sadly I didn't manage to do the handmade Christmas that I had hoped for everybody... maybe next year?) 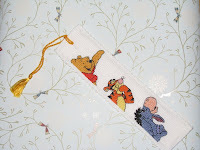 is this little pooh bear book mark for a friend who is also a huge pooh bear fan. Before starting it I had managed to forget just how long it takes to do a cross stitch piece and I really couldn't quite believe just how many hours this little bookmark sucked up. Ah well, it still looks lovely.